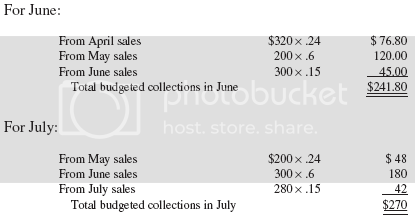 The sales budget is the starting point in preparing the master budget, since estimated sales volume influences nearly all other items appearing throughout the master budget. The sales budget should show total sales in quantity and value. The expected total sales can be break-even or target income sales or projected sales. It may be analyzed further by product, by territory, by customer, and, of course, by seasonal pattern of expected sales. Frequently there are time lags between monthly sales made on account and their related monthly cash collections. For example, in any month, credit sales are collected in this manner: 15 percent in month of sale, 60 percent in the following month, 24 percent in the month after, and the remaining 1 percent are uncollectible.